Kilimanjaro is a very popular place for walkers with around 25,000 trekkers attempting the summit each year. 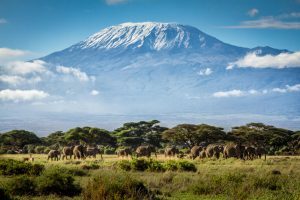 Despite being the highest peak on the continent Kili, as it is affectionately known, is relatively accessible to anyone with a good level of fitness. Apart from fitness, the key elements to reaching the summit are a good route, enough time to acclimatise, proper equipment and a good team of guides and porters. Mount Kilimanjaro is the highest mountain in Africa and the highest free standing mountain in the world. The summit is called Uhuru Peak and stands at 5,895m or 19,341 feet. Mount Kilimanjaro is situated in the Northern part of Tanzania, in the Kilimanjaro National Park. The park extends over an area of 100 kilometres by 65 kilometres. We are using the Machame Route which offers some of the most scenic experiences that you can have in Tanzania, with landscapes ranging from rainforest through alpine, “lunar” and artic.